On the hunt for joy, I’ve found many things the past two days that have made my heart smile, but as I slouched through yesterday with the beginnings of a cold and a fever all day, I couldn’t string together a coherent thought. So I drank my lemon water and applied my Thieves oil to my feet and went to sleep. I woke up this morning still groggy (but who isn’t at 4:30? ), but after exercising with a friend and time in the Word, I realized, I didn’t feel icky anymore! Day 3 is carpeted floors. This one is so funny to me. I’ve had wood floors for most of the past twenty years. I love the look, feel, smell – everything – about wood floors. But nine years of vacuuming a whole lot of square feet of wood floors followed by moving to this house which has zero wood, very little tile, and a whole lotta carpet, I found myself giving thanks for carpet tonight. As I did finishing touches for house guests the next two evenings, I gave thanks and smiled at the fact that, because there isn’t wood, the girls are able to take on significantly more of the house work, making my job much less hectic. And that’s definitely a joy-giver! What glimpses of joy have you seen so far this week? 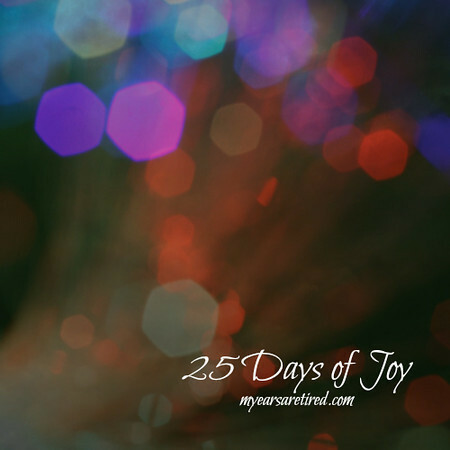 ← 25 Days of Joy!